Christmas decorating ideas give great inspirations for beautifying your home in winter. Starting from the front door you can add Christmas decorations to every rooms, creating festive and elegant atmosphere for Christmas and winter holidays. 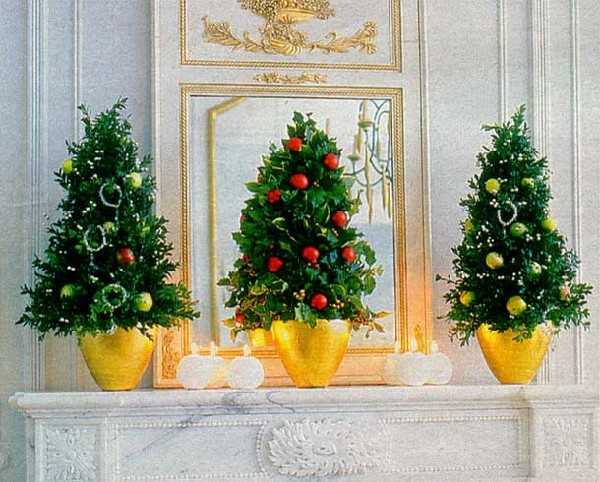 Here is a collection of Christmas decorating ideas from Canadian magazine Chatelaine. Simple and beautiful Christmas decorating turns rooms into bright and welcoming places for winter holiday season. Turn up the holiday magic with these inspirations and turn down the pressure with five quick and attractive Christmas decorating ideas from DIY guru Michael Penney. 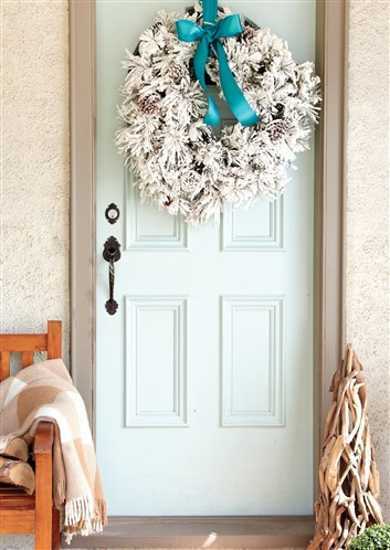 Door decorating with a lush wreath sets the mood and brings the winter holiday spirit into your home. Miniature Christmas tree and small live Christmas tree are two beautiful Christmas decorating ideas and wonderful alternatives for green holiday decoration. Baby evergreen plants from the local garden center, placed in a small tumbler or vase, make gorgeous Christmas table centerpieces, adding a unique aroma of winter holiday to your dining room decorating. Snip a tiny cutting from the back of your small live Christmas tree, wrap the base in burlap and tie with twine, and you can enjoy beautiful Christmas table centerpiece, sprayed with faux snow for amazing winter holiday decoration effect. 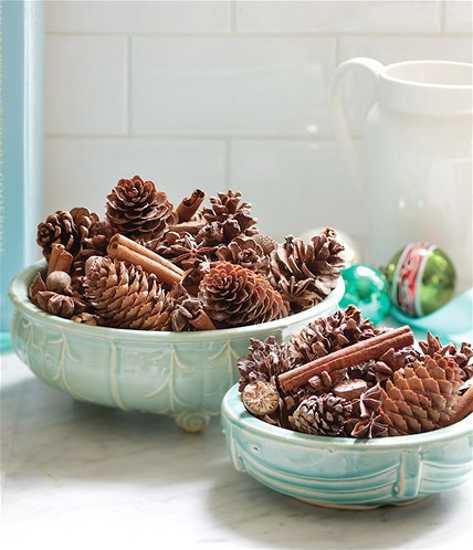 Bowls and vases with pine cones and cinnamon sticks smell a lot like Christmas, creating fragrant Christmas decorations for all your rooms. Make your own potpourri by combining pine cones, star anise, halves of nutmegs and cinnamon sticks to spruce up your Christmas decorating ideas with pleasant aroma of winter holiday season. This combination, sprinkle with cloves and placed in decorative bowls makes excellent winter holiday and Christmas table centerpiece and charming decorations for any room in your home. Paper crafts are a great way to enhance the winter holiday spirit. Scrapbooking paper strips in different colors, stapled into rings, looping them through one another, make beautiful garland for Christmas decorating. Attach this Christmas garland to the banister with ribbons, greenery and large ornaments to enjoy simple and original Christmas decorating ideas. 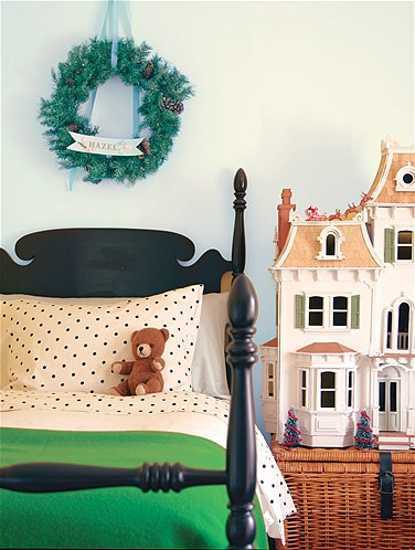 Hang Christmas wreaths in guest bedrooms and kids rooms with personal names written on decorative paper. Decorated with a bright ribbon and attached to the wall, Christmas wreaths make room decor feel festive and cheerful. Decorating a fireplace mantel with boughs of evergreens is one of traditional Christmas decorating ideas that can be personalized with meaningful letters and handmade decorations. Tuck oranges, lemons and tangerines in among the greens, toss in a few pine cones for creating bright and elegant Christmas decorating.